(October 4, 2018) Menomonie, Wisconsin ace Jimmy Mars traveled to ABC Raceway in Ashland, Wisconsin on September 28-29 for the annual running of the 'Red Clay Classic.' Behind the wheel of Paul Gilberts' #28 MB Customs Late Model in the $5,000 to win show, Jimmy ran third in heat race action on Friday night prior to picking off six competitors during Saturday's headliner en route to a strong third place podium effort behind only winner Ricky Weiss and runner-up Travis Budisalovich. In Open Wheel Modified competition at ABC Raceway, Jimmy ran fourth in his heat race, won his B-Main, and later drove up to eighth in the $3,500 to win feature event. Full results from the 'Red Clay Classic' weekend can be accessed online at www.abcraceway.com. Mars Racing, who will take the upcoming October 5-6 weekend off, will now prepare to make a return trip to the hallowed high-banks of Eldora Speedway in Rossburg, Ohio on October 12-13 for the remainder of the 48th edition of the fabled 'World 100.' Jimmy finished a strong eighth in his Twin 25 back on Thursday, September 6 before inclement weather postponed the final two nights of racing action at the "Big E." Things will pick up right where they left off on Friday, October 12 with a pair of Twin 25s - each of which will boast a $10,000 payday. Combined points from the two prelim nights will set the lineup for Saturday's traditional six heat races. Following the heat races on Saturday, October 13 at the 1/2-mile speedplant, two consolation races will finalize the starting field for the 48th Annual 'World 100.' A huge crowd is expected to file into Eldora Speedway to witness the 100-lap crown jewel spectacular, which is set to pay a hefty $51,000 to the winner. 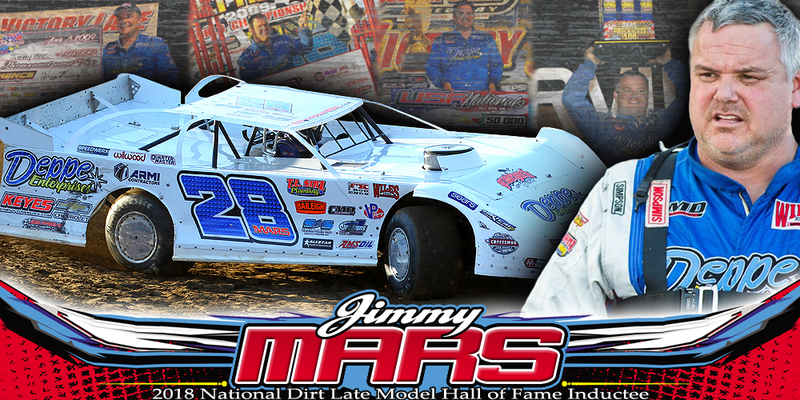 Jimmy has transferred into fifteen 'World 100' headliners throughout his storied career with his best finish of fifth coming back in 2004 behind winner Chub Frank, Don O'Neal, Brian Birkhofer, and Dan Schlieper. Learn more about next weekend's festivities in the Buckeye State by pointing your web browser to www.eldoraspeedway.com.